SOMEONE GAVE ME A SEMPERVIVUM PLANT. OUT OF THE CENTER OF THE MANY HENS AND CHICKS IN THIS POT IS A 2-FOOT GIANT STALK WITH LITTLE SPIKY FLOWERS??? GROWING OUT ITS TOP. WHAT IS THIS STALK . . . IT LOOKS LIKE AN ALIEN,. I WAS TOLD THE STALK SIGNIFIES THE END OF THE PLANT'S 3-YEAR LIFE SPAN. IS THIS TRUE ??? WANT TO PROPOGATE IT. HAVE BEEN READING UP AND AM EXCITED!!! PLEASE HELP. The way Sempervivum operate is to live for two to three years as a chick and then a hen, then the hen (mature rosette) will flower, after which they die - they're known as 'monocarpic' which means 'once flowering'. Not all hens in a colony flower at the same time - it seems to be around ten percent or so at any one time. I've added a picture to your post to show this percentage in action. 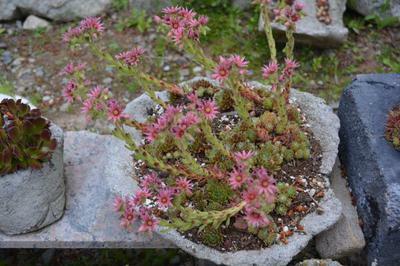 This hypertufa bowl is planted with a colony of smaller type Semps, which continues to increase every year. Occasionally I remove a few rosettes to put somewhere else, from out of the center (tip: dig them out with a kitchen fork). They flower in a short season of a few weeks, but it's hardly ever the whole colony, only a few. There is nothing you can do to prevent this. I've tried. Hopefully, there are chicks that will replace the dying hen, to take over. You can also collect the seeds and grow them, but these will be different again from the original plant. Vegetative propagation (ie: the chicks) will be identical. Seed grown progeny, not.